This course is delivered by the Faculty of Health, Social Care and Education. It is a unique partnership between Kingston University and St George's, University of London. This means you benefit from the experience and facilities of two complementary institutions. 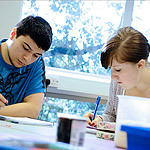 Kingston University has a long-established reputation for high-quality, vocationally relevant education. St George's, University of London combines teaching and research excellence in areas directly applicable to healthcare sciences. The combination of academics, expert practitioners, service users, carers and alumni gives the Faculty a uniquely dynamic environment in which to further your studies and your career. We also have strong links with the NHS, education and healthcare providers and social services. We offer classic postgraduate programmes alongside research and continuing professional development (CPD) opportunities. Where is the Faculty based? The Faculty is split between Kingston University's Kingston Hill campus and St George's, University of London in Tooting. See further details of staff in healthcare.